Dog treats: A staple of the doggie gift basket. If you need a happy for the dog or dog lover in your life, craft a canine gift basket. It's simple, creative, personal and unique. What you put in the basket depends on the dog, its owner and the personalities of the two. Every dog needs safe and durable toys with which to play. Look for tug-of-war ropes, chew toys, rubber balls and stuffed animals to pack into your gift basket. Remember to keep toys appropriate for the dog’s size and temperament; large, powerful dogs could choke on small balls; little dogs will not have much luck retrieving a soccer ball. Pet supply retailers sell a wide array of dog toys for all kinds of dogs. Healthy dog treats, critical for obedience training, make a nice bonus for a dog that is being particularly good. They give owners a simple way to indulge their pups from time to time. Instead of picking up store-bought, mass-produced treats, try visiting a natural pet food store and purchasing a few of the high-end treats. A doggie gift basket isn't a doggie gift basket if it doesn't have a handful or two of healthy, high-quality treats. In addition to treats and toys, choose a piece of gear for the basket. 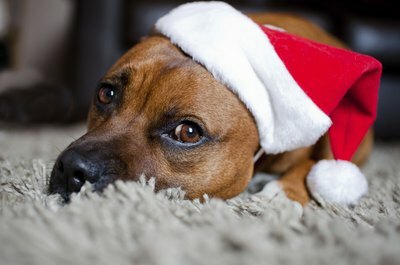 Collars, leashes, poop bags, harnesses and sweaters are smart items to pack into a gift basket. Think about the life your friend and his dog lead, and try to find an item that will make things more fun for them. For example, if your friend takes his dog on long hikes, a collapsible water bowl or a doggie backpack will see a lot of use. With any dog-related gift, be aware of any health problems the dog may have. An older dog with failing teeth may not be the best recipient of a new rawhide bone, while dogs with food allergies may require that you skip most treats or inquire to determine which are appropriate. Destructive dogs are poor candidates for stuffed toys, especially those with squeakers. If you have questions about the appropriateness of your gift, talk to the dog’s owner before making any purchases.